00:03 Joel Harford: Hi. 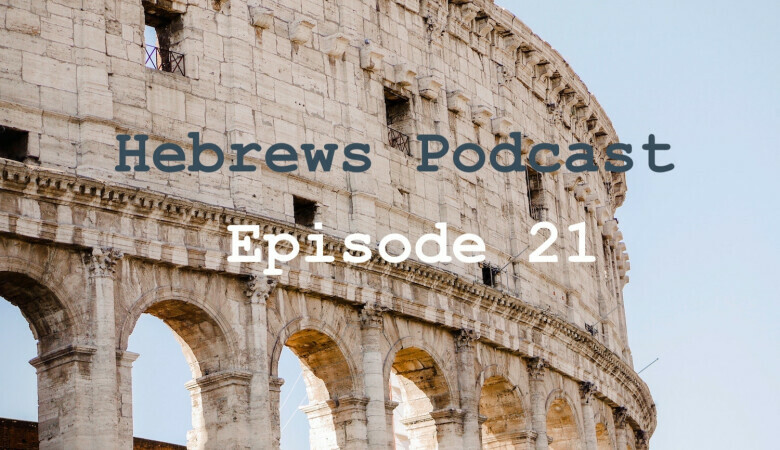 Welcome to the Two Journeys Podcast. This is episode 18, in the Book of Hebrews, titled, The Earthly Tent was Patterned After the Heavenly Tent. Where we discuss, Hebrews 8:1-7. I'm Joel Harford, and I'm here with Pastor Andy Davis. Andy, we're moving from the priesthood to the arena of the priesthood, the heavenly tent, in chapter 8. Can you give us a brief overview of how this argument continues to develop? 00:28 Pastor Andy Davis: Yeah. I think what we've been saying, in the Book of Hebrews, is that, a superior mediator [Jesus], brings in a superior covenant, resulting in a superior life. And he's going to openly make the case for this. I think Hebrews 8:6 may, to some degree, be the theme verse for the entire book of Hebrews. In which it says, "The ministry Jesus has received is as superior to theirs as the covenant of which He is mediator." Superior to the old one, and is founded on better promises. So this is a superior mediator, and He brings in that superior covenant. So, when I keep saying that, week after week, it's not like I made it up, it's coming right from Hebrews 8:6, so it's pretty exciting. 01:07 Joel: Yeah. Well, for the sake of our audience, I'm going to read the first seven verses of Chapter 8. "Now the point in what we are saying is this: We have such a high priest, one who is seated at the right hand of the throne of the Majesty in heaven, a minister in the holy places, in the true tent that the Lord set up, not man. For every high priest is appointed to offer gifts and sacrifices, thus it is necessary for this priest also to have something to offer. Now if he were on earth, he would not be a priest at all, since there are priests who offer gifts according to the law. They serve a copy and shadow of the heavenly things. For when Moses was about to erect the tent, he was instructed by God, saying, 'See that you make everything according to the pattern that was shown you on the mountain.' But as it is, Christ has obtained a ministry that is as much more excellent than the old as the covenant He mediates is better, since it is enacted on better promises. For if that first covenant had been faultless, there would have been no occasion to look for a second." 02:15 Joel: So starting in verse one, he tells us, the author tells us straight up what his point is. "The point we were saying is this, we have such a high priest." So Jesus has come, He's here, we finally have Him. He's not like the old priests. But, he says, he's "seated at the right hand of the Majesty of the throne in Heaven." What do you get out of this image of Jesus seated? 02:36 Andy: It's a very powerful image, really. We were just talking about this, you and I, a moment ago, how it seems like there were no places for the Aaronic or Levitical priests to sit. They were constantly needing to offer animal sacrifice, it was endless. The endless repetition meant you didn't have any time off, and so there was no place to sit, the work was never finished. But, with Jesus, He sat down at the right hand of the Majesty in Heaven. And so the fact that He's seated shows the once for all finished aspect of His atoning sacrifice, a pretty beautiful image. 03:10 Joel: Yeah, the finished work. So that must be what He speaks of on the cross, right? "It is finished." 03:15 Andy: Yeah, absolutely, that's a beautiful connection. Yeah, it is finished. So, this is paid in full, the debt is paid in full, there's nothing that could be added to it. 03:24 Joel: Now the author calls Jesus, "A minister in the holy places in the true tent that the Lord set up, not man." So, what is this true tent that the Lord set up? 03:35 Andy: Yeah. This is one of these things where the author is just going into the invisible heavenly realms, and telling us mysteries and things that we would not know any other way. But there are indications. And in Exodus 25:40, the Lord said to Moses, "See to it that you make the tabernacle according to the pattern that I showed you on the mountain." And so it seems that Moses had some kind of a vision of the heavenly tabernacle that the earthly tent was just a copy and a shadow of. And so what the author is doing really here is pulling ranks, "Hey, don't tell me that that tabernacle came first and now Jesus is like a Johnny-come-lately, He was coming later." No, no, no, it's the other way around. The heavenly image of the tabernacle was established in the heavenly realms by the hand of God before Moses ever made anything. So, we've got this idea of a heavenly reality. And frankly, both the tent and the later temple were just copies and shadows of it, and it's interesting how the pattern was given to Moses, in Exodus 25, for the tabernacle, the movable tent. 04:47 Andy: And then you remember in the course of time, David settled in the city of David in Jerusalem, wanted to make a permanent place for the Ark that it wouldn't be in a tabernacle anymore. He said he wanted to make something, and Nathan, the prophet encouraged him, but then later came back with the word saying, "It's not going to be you that will build it, but your son will build it." And then, beautifully, in 1st Chronicles 28, he gives Solomon, in verse 11 and following, 11 and 12 and on in verse 19, he gives Solomon the plans for the temple, and then he says very plainly, "I got all of this in writing from the hand of the Holy Spirit on me, and it was also itself a type or copy or shadow of the heavenly reality." So what the author is doing is, he's saying, "The heavenly reality preceded and is far more significant than both the tent and the temple." 05:42 Joel: Right. So, let me just jump outside of Hebrews, and ask this question, why then did God set up the earthly tabernacle? Why not go straight to Christ, why this drawn out history for hundreds... And then over 1000 years to 2000 years, (when you consider the call to Abraham). Why did God drag it out so long.? Why didn't He bring Christ first? 06:04 Andy: Well, I think it was to teach us, I think that we needed to learn the significance of who Jesus is, who He was, and He is going to say in 9:9, that this is an illustration for the present time, or it's a teaching tool. So the animal sacrificial system was a teaching tool, to teach us some important lessons. We'll talk about that more another time. But the fact is that it was to teach us how our sins could be atoned for. And so He set up this centuries long teaching tool, so that we would understand when Jesus finally came, when in the fullness of time, Galatians tells us that the right time when the human race had been indoctrinated and ready, now we can understand it. And so both the tabernacle and Temple and all of the animal sacrificial system, all of that was a teaching tool to point toward the cross of Christ. 06:54 Joel: Right. And we should have known it was a teaching tool, even back then he says, in verse 7, "If the first covenant had been faultless, it would have been no occasion to look for a second." So they should have been looking for a second, knowing that it was not sufficient to make perfect. 07:08 Andy: Absolutely. Yeah, the fact is they knew in their hearts. David knew when he committed sin with Bathsheba and had her husband killed to cover it up, there was nothing animals could do to help him. The blood of bulls and goats, could not take away his sin, he knew that, could not clear the conscience of the worshiper the Book of Hebrews will tell us. They knew that there had to be something else, but then the prophets would tell them. In Isaiah chapter one, he says, "Stop all this animal blood. You're missing the point, you folks are completely wicked," and all of these things. So they should've known that the Old Covenant was just a type and a shadow, and it was pointing towards something better. 07:43 Joel: In verse 3, he says, "For every high priest, is appointed to offer gifts and sacrifices, thus is necessary, for this priest, to also to have something to offer." So if Jesus is a priest, he needs something to offer. But it says in verse 4, "If He were on earth, He would not be a priest at all, since there are priests who offer gifts according to the law." So why is it that Jesus is not fitting to be an earthly priest, he must be a heavenly priest? 08:06 Andy: Right. The author went into this in the combination of the office of king and priest was forbidden in the Mosaic covenant, that they came from different lineage, different genealogy, one of them from the tribe of Levi, he was a Levite, and from the sub group of Aaron. And so, also, Jesus, as the King, was following the lineage of Judah. The throne would not, the scepter would not depart from Judah and the sub-group of David. He was the son of David. So they're separate, and they could not be combined. So there had to be a New Covenant. So, if He were on earth, He could not have served. He would not have been a priest, but just a king. Now, it's interesting, the whole point in these seven verses here, in Hebrews 8, is the superiority of Jesus' priesthood ministry is shown by the location of where He does His ministering. He ministers, as we learned in the last chapter, such a high priest meets our needs. This is, I think, 7:26, He is exalted above the Heavens. 09:10 Andy: So He is not only in Heaven, but He is actually above the Heavens. He's at the right hand of the Majesty in Heaven. Again, Psalm 110, "Sit at my right hand and there you'll do your priestly ministry." So Jesus is up in the exalted regions, even beyond the heavenly regions, that's where the true tabernacle lives. Really, is in the mind and character of God. It's not even so much of a location, but it really is in relationship to the purposes and plans of God, that's where He does His ministry. 09:39 Joel: Right. Then he says in verse 5, that these priests, the Levitical priests, they serve a copy and shadow of the heavenly things. And then he explains the verse that you were talking about earlier, that when Moses was about to erect the tent, he is instructed by God, saying, "See that you make everything according to the pattern shown you on the mountain." So how was the earthly tent a copy and shadow of the heavenly things? 10:03 Andy: Yeah, it's a mystery. And he's going to go into it, in a little more detail, in chapter 9, with the Holy Place, and the Most Holy Place, and all of these sort of things. And he goes into some of these, he said, "There's more to learn." And I actually believe. And I'm writing a book right now nn heaven, that we're going to be learning a lot of new things in heaven. He doesn't even go into great detail in chapter 9, he's like, "Well, tell you what, wait till Heaven, I'll show you just all the symbolism and the details, the things that you would miss." But it was set up with the outer walls and inner walls, and the cordoned off areas, and all that sort of stuff, to teach certain lessons. And so, that pattern that Moses had that is laid out first in the Book of Exodus, that tells us where those curtains would be, and this is the Holy Place, and this is the most Holy Place, and all that. It was a pattern that he had seen based on a heavenly reality. So that's what he's saying, all of these things were just a copy and a shadow. And that again points to the superiority of the New Covenant, it's based on the real thing, based on the real tabernacle. Set up not by humans, but by God. 11:07 Joel: And so he does say, "Jesus Christ has obtained a ministry that is as much more excellent than the old as the covenant He mediates is better, since it is enacted on better promises." 11:17 Joel: So can you address the two things here? One, what are the better promises, and, two, how is the covenant better? 11:23 Andy: Well, he's about to give us the better promises in the rest of chapter 8. So as the promises come out from the Book of Jeremiah, the Three-Fold promise we'll talk about it, God-willing, next time, but that, 1) "I will be their God and they will be My people." So that's relationship. And 2) "I will forgive their sins, and remember their inequities no more," and 3) "I will write My laws in their minds and put them on their hearts." These are promises the Old Covenant could not do. So that's some of the better promises. But it's really, the better promises are all summed up in eternal life, in an eternal relationship with God. All of the good stuff of salvation comes in the New Covenant, comes in the work of Christ, not in the blood of bulls and goats. So it's enacted, it's founded on better promises. And I love how he compares it. It's like, the ministry He has received is as superior as the place where He ministers, is superior. That's infinitely above it. And so His ministry is infinitely above the Aaronic priesthood. It's just that much better. It's the same proportional distance, which is infinity. It's amazing, when you look at it. 12:21 Joel: So then, could we say that the New Covenant is infinitely better than the Old Covenant? 12:24 Andy: Really so. Really so. The Old Covenant, it served a purpose, it is called weak and useless, but it still was pure and holy, and right. There was nothing wrong with it, but there was something wrong with us. And that's the whole thing. In Romans 8:3 says the same thing. There's nothing wrong with the law, there's something wrong with us. But the law couldn't make us holy, it couldn't make us perfect. It can only tell us what holiness and perfection look like, but once we violated it, it could not make us holy, or perfect, or forgiven. 12:57 Joel: Right. And the New Covenant, it is eternal, and there's a reference that's eluding me right now, but I knew there's a reference where the Scriptures talk about the blood of an Eternal Covenant. 13:08 Joel: So there's an eternal nature, an infinite nature to the New Covenant, whereas the old was clearly temporal, and it's gone. 13:14 Andy: Yeah, temporary. Yeah. And we'll spend forever in that... I love the word, new. Because it's going to come in, and in the Book of Revelation we got the New Heaven, New Earth, and the New Jerusalem. And in the middle of all that, we have the New Covenant. So it's permanent, it's eternal. 13:31 Joel: So the New Covenant's here, it's a better Covenant, it's superior, it's eternal. So the Old Covenant's passing away. So can you take us to Acts 7, where Stephen preaches just a phenomenal sermon, and he gets this violent reaction from Jewish opposition. What insights was Stephen sharing there that we can draw on? 13:50 Andy: Yeah, based on the accusations that they make at the end of chapter 6, Acts 6, they're saying, "This fellow is saying that this Jesus is going to change the customs handed down to us from Moses, and destroy this temple, and then make it obsolete." And, actually, I think that's exactly what Jesus came to do. And, Stephen, it seems, through the power of the Holy Spirit, saw it all before maybe almost anyone else. Maybe even before Peter, and neither the Jewish believers at that time for the animal sacrificial system was over. And so he started making it plain, and they could not handle that. First of all, they were unbelievers, they weren't believers in Christ. It's hard enough for the believers to handle believing Jews who trusted that Jesus was a Messiah, but to be told, "Yes, but now all the Mosaic regulations about animal sacrifice, the whole system is done, it's obsolete." That's hard to hear. It's true, but hard to hear. It seems that Stephen saw it before anyone else. And they said, "This fellow says that this Jesus of Nazareth will change the customs handed down to us by Moses, and will destroy this Holy Place." 14:55 Andy: And so, in Acts 7:44-48, he basically summarized and says, "Look, that's where the Tabernacle came from. The Most High does not live in temples build by our hands, and He is not served by human hands, as if He needed anything." And that's what he's saying. He's saying, "Look, God doesn't dwell in temples. Alright? He dwells in the Heavenly realms, and he doesn't dwell on anything you make." Solomon knew that, when he said, "Well, this golden box that I've made here on planet earth, actually, will God dwell in it? Heaven, even the highest Heavens, can't contain Him." Solomon, I think, under the inspiration of the Holy Spirit, understood, Jesus is exalted above the heavens. So there is nothing on earth, there's no box we could make, there's no cathedral, there's no magnificent brand new church building that could ever be worthy to house the living God. And so Stephen, I think, saw all of that and he started to realize the real dwelling of God, with humanity, is going to be by the Spirit, it's going to be spiritual. And Paul said it, in Ephesians 2, that, we are a temple in which God dwells by His Spirit." The Churches, we redeemed people. But Jesus' ministry is superior, and what it meant was that that Old Covenant, that time had gone, it was done. Well, they couldn't handle it, and they just killed him. 16:15 Joel: Yeah. It was very hard for them. They had this almost mystical view of the temple, in Jeremiah. They think that Jerusalem can't be destroyed, because they have the temple. 16:24 Andy: Yeah, well, they had that view repeatedly. The had it in Jeremiah's day, when they thought during... In Jeremiah's day, the temple was just about to be destroyed by the Babylonians. Jeremiah said it's going to happen. And they were trusting in the Temple of the Lord thinking "God will never let Jerusalem be destroyed, because the Temple of the Lord is here." And they'd say it over and over, like a mantra, "The Temple of Lord, the Temple of Lord, the Temple of the Lord." He told them, "Go to Shiloh and see what happened" In other words, in your mind, go back in time, to the days of Eli, the priest. When the Ark of the Covenant was captured by the Philistines. God has no problem letting the golden box be captured or destroyed. Because the true, the reality is in Heaven, and Jesus is the true mediator, the true high priest. 17:06 Joel: Yeah. Do you have any final comments on these first seven verses? Obviously, there's a lot of new covenant that we get into in the next podcast. Do you have any more? 17:13 Andy: Yeah, just pondering that Jesus, like it says in Hebrews 7:26, that Jesus is "holy, blameless, separated from sinners, exalted above the Heavens." It's hard to even picture it in our minds, but the exaltation of Jesus. He is infinitely above us, and that we should esteem Him, worship Him as God. And realize, He is your mediator, He is your priest, and He's praying for you. How secure should that make us? How much should we celebrate His priestly ministry? 17:43 Joel: Yeah, Amen. Well, that was Episode 18, in the Book of Hebrews. Please join us next time, and we'll talk about the new covenant from Hebrews 8:8-13. In my view, these are some of the greatest verses in all Scripture, so you do not want to miss them. Thank you for listening, and God bless you all. 18:02: Thank you for listening to this resource from twojourneys.org. Feel free to use and share this content to spread the knowledge of God and build His kingdom. Only we ask that you do so for non-commercial purposes and in accordance with the copyright policy found at twojourneys.org. Two Journeys exists to help Christians make progress in the two journeys of the Christian life, the internal journey of sanctification, and the external journey of Gospel advancement. We do this by exporting biblical teaching for the good of Christ Church and for the Glory of God.